Known for its beautiful green leaves and colorful stalks, rainbow swiss chard is a great substitute for spinach. It can be steamed or eaten raw in a salad for an extra kick of nutrition. If you love this tasty leafy green, this guide is for you! Take your rainbow swiss chard from seed to plate! Did you know Swiss chard goes by many names? The plant actually has numerous monikers, including silverbeet, Roman kale, “Bright Lights,” and strawberry spinach – but all are referring to the same plant which was discovered by a Swiss botanist. It’s still a staple and popular in Mediterranean areas. 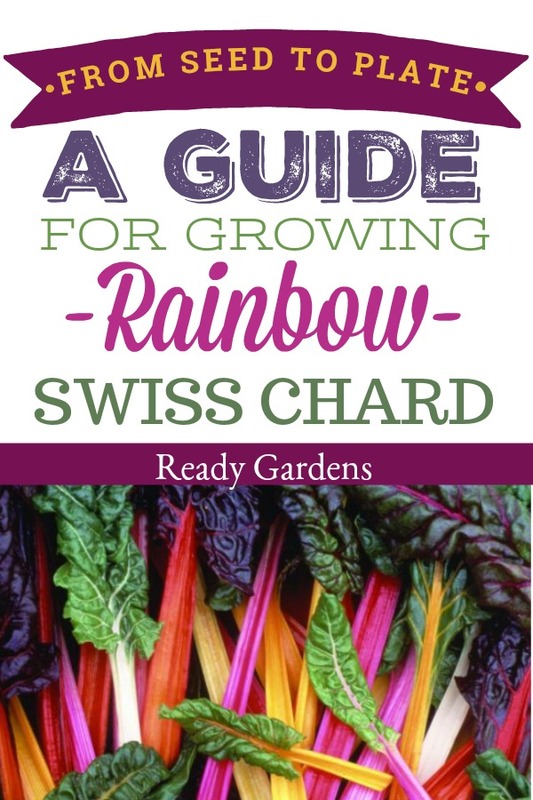 If you’ve ever considered attempting to grow Rainbow Swiss chard, why not give it try? It’s relatively easy to grow with few pests to worry about! Plus, it’s a beautiful addition to an edible landscaping or ornamental design. 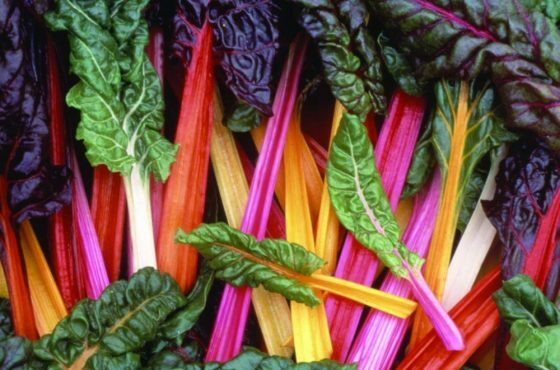 Helpful Hint: Before planting, soak your Rainbow Swiss Chard seeds in warm water for 15 minutes. This will help speed up the germination process. Avoid planting Swiss chard in very early spring. While the plants can tolerate a mild frost, some will go to seed prematurely when exposed to prolonged freezing temperatures. Start planting Swiss chard seeds about 2 to 3 weeks before last expected frost. Start the seeds inside if you prefer earlier crops and an earlier harvest. Sow seeds ½ to 1 inch deep, 2 to 6 inches apart, in rows 18 to 24 apart. If possible, plant in full sun early in the season and plant in partial shade in summer when it’s warm. Swiss chard seeds grow the best in deep, loose, fertile soil, high in organic matter, with pH 6.0 to 7.0. Needs consistent moisture, especially as plants grow large, but also need well-drained soil. Like beets, chard “seeds” produce more than one plant and will, therefore, require thinning. Thin to 6 – 12-inch spacings. .Mulch plants to retain moisture and suppress weeds. Leaf spot: This is a fungal pathogen also can infect spinach. Symptoms are small, light tan to brown, round to sometimes angular spots whose border is often purple to red. Leaf spot (Cercospora) can be cured with a fungicidal treatment. Downy mildew: Also a fungus, this appears as yellow to white patches on the upper surfaces of older leaves. On the undersides, these areas are covered with white to grayish, cotton-like fungi. The best treatment for downy mildew is prevention. Downy mildew is fairly easy to control on most plants when the foliage and fruit are kept protected by a copper spray. Begin treatments with the copper spray two weeks before disease normally appears or when weather forecasts predict a long period of wet weather. Alternatively, begin treatment when the disease first appears, and repeat at 7-10 day intervals for as long as needed. You can begin harvesting your rainbow Swiss chard when the leaves reach a usable size. Remove a leaf or two from each plant, or cut plants an inch or two above the soil for cut-and-come-again harvest. Avoid damaging the growing point in the center of the plant at harvest. As these plants age, the older leaves tend to get tough. Cut plants back to about 3 to 5 inches tall to encourage a flush of new, tender growth. The added bonus of growing some Swiss chard is that when sauteed correctly, kids will not only eat it but love it! If you’d like to give sauteed Rainbow Swiss Chard a try, prepare it in a cast iron pan (non-enameled) for even better iron content and absorption. Another helpful tip to get even more of the nutrients out of your greens is to prepare the chard with some good fats such as butter, ghee (clarified butter), or olive oil. This will improve vitamin and mineral absorption. Saute your well-washed chard only until it is dark green and wilted, not black. Keep in mind that the chard directly over the heat will cook faster, so moving it around during cooking will help. Try adding garlic and onions if your kids like them! This is a winning combination with the chard because the sweetness combines well with the bitterness of the chard. Top it with a little Parmesan cheese and a pinch of salt and pepper and the kids will come back for seconds!